There are no idle hands here...lol. Today I stayed busy puttering!! I am ready for Christmas, so today I played. But, things needed for after holidays. 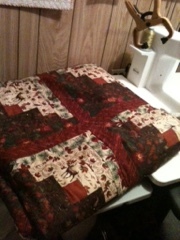 I pin basted this log cabin, customer quilt to be machine quilted. Then I started a quilt I've been wanting to make. I will putter over Christmas with this. 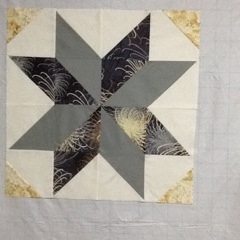 Here is the first block...with fabric purchased from Spruce it up Quilting...hi Lorrette!!!! And Kona Linen for background. And, I have this crib quilt finished. 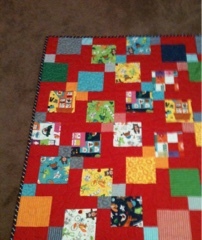 This was a win from Quilter's Way, a kit...thanks so much guys. I really like it. So nicely colourful! Well,that is my day...have a good week. Nice to have some free time for puttering at this time of the year. Can't wait to see how that star block quilt turns out. Love the fabrics you chose. Merry Christmas, Marjorie! Have a good one.